Don't suffer from foot pain caused by uncomfortable shoes. This is a guide about buying comfortable shoes. 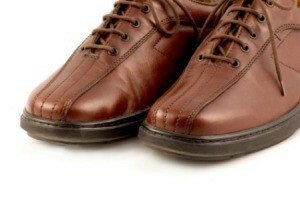 When buying shoes, always try on both shoes and walk around in them to make sure you get the right fit. Sizing can be inconsistent from different shoe manufacturers so be sure to try on different sizes. Your feet swell as the day goes on, so trying on shoes in the afternoon will give you a better idea of how they will fit after wearing them for a while. Two males in our family have the same problem. They both buy shoes and before long are not able to wear them because they are uncomfortable for their feet. They end up buying several pair and changing them frequently. Currently neither one has a pair that is comfortable for their feet. What do they look for to find shoes they can wear and what is the problem? Gee what a dilemma! I suspect they aren't being sized right. Maybe they need to go to a good shoe store (if they aren't already) and get sized by somebody who knows how to do it. They could be like me. A salesman told me once, after measuring my feet, that "they don't make shoes for feet like yours!" I asked him whose shoes I had been wearing all my life. Go to somebody kind. Glenn's Mom is so right! Women aren't the only ones who are vain about their feet. It took me almost 10 years to convince my husband that you don't buy shoes by fitting them on your smallest foot. Now he fits on his bigger foot and just adds an extra pad in the shoe for the smaller foot. Our feet get bigger as we age, but some people refuse to believe this reality. My 7B in high school has become 9D! But my feet are comfortable. zappos.com They have a lot of info on their web site, like how to measure each foot, etc. They also have hard to fit sizes. They also offer free shipping when purchasing and if they don't fit and or you don't like them free shipping going back. I am a hard to fit foot and I love them. Plus, the other buyers on their review the shoes and let you know who they fit, where they hurt, etc. Maybe a visit to a foot specialist or chiropodist is in order. They may have things affecting their gait etc that could be corrected. I am a big fan of orthotics for foot comfort. It wasn't mentioned what is exactly uncomfortable about them. If it has to do with the bottom of the feet have those comfy Dr. Scholls inserts been tried? My son works on his feet and won't wear anything by New Balance. First thing to do is to go to a really good shoe store where they measure your feet, have inserts, and so on. The one I went to sold Birkenstocks and a couple of other lines of good quality shoes. Some have machines that check out your gait, and so on. Also, you can't wear cheap shoes and expect to be comfy if you have problem feet. You have to buy good quality shoes from a store that knows how to fit them. Skechers, if you are like my husband that puts most of the pressure on the front of his feet and less on the heel and middle. We both wear them and have for years. If you go through shoes alot, then the trick is to buy 3 pairs at the same time and trade off everyday, letting the shoes expand back and they will last a year or more. Skechers are a good value at average $50 a pair for a good walking shoe. I know exactly how they feel. My sister owns a good quality shoe store and has proven to me over and over that I can't buy lower end shoes and expect them to feel good, especially over time. She has fixed me up with some very nice $130 shoes that have lasted me for 6 years of wearing almost every day. She fixed me up with several brands and types on my last visit and they are also very comfy and attractive. I can even wear 2 inch heels in the good brands. She has proven to me that the cheap shoes are not only painfully uncomfortable, but they really aren't cheap in the long run since I bought pair after pair searching for something comfortable. Cheap ones also don't hold up well so they have to be replaced often. An all leather shoe is best because they breath and can be slightly stretched to give where you need them to by using a bit of stretching solution and wearing them for a few hours. A shoe stretcher can be used with the solution instead, but she told me that if I could deal with the very slight dampness for just one day or so, they would relax to exactly my foot's shape, instead of trying to get those little inserts on the stretcher put in just exactly the right location for the weirdities of my feet. My first brand suggestion for a good quality semi-dress shoe would be something from the Propet line. Also, do be sure to go to a store that has the I-Step machine to see the digital readout of your individual feet. Dr. Scholl's has that type of matching out now but the only help you'll get from that one is what orthotic insert to buy to go into a shoe. If you buy good shoes, you shouldn't need the orthotic inserts, for the most part. Hope this helps! I would definitely find out if the size is correct. Quite possibly the length is okay but they need a wider size. I know that makes a world of difference for my husband and me too. Does anyone know where I can get shoes for a high instep? My instep is so high that I cannot get in a shoe or boot that has to go over it. I really need something to cover my instep as they are now so big and swollen that little kids are picking on me (lol). I think it is scaring them. I am desperate, do not care about the price. This has been a big problem for me as well. You may need to get custom insoles. I'm sorry. Where can I shop for cheap, but nice shoes? There are lots of deals on shoes on the net. Try 6pm.com - Also Payless does have some nice shoes if you shop on sales & look very carefully. If you are in India, you most likely will need to shop via the internet. Here in the USA, I shop at a factory outlet store for good buys on shoes. I prefer the Easy Spirit brand of shoe because they are well-made and comfortable. Factory outlet stores have sales, too. I used to buy shoes from Payless shoe store, but once I found I can buy well made shoes for only a little less, I quit buying them there. The shoes I bought at Payless made my whole body hurt because I did not have a good foundation to stand on. Better shoes cushion my step and support my foot.